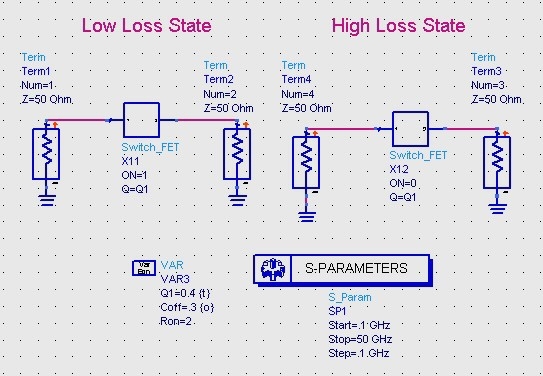 On this page we'll show you how to make an open circuit out of the OFF state of a switch FET that seems like it has too much capacitive reactance to be useful at 50 GHz. This technique has little effect on the ON state of the switch FET. 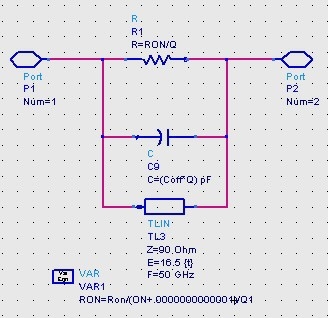 In this example we'll use the trick we showed you for how to make a two-state circuit in ADS, but we'll put both states into one four-port network. S11 and S21 correspond to the low-loss (resistive) state, S33 and S43 correspond to the isolation (capacitive) state. 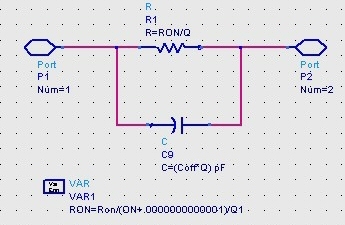 You'll see this four-port technique used time after time whenever two circuits are worth comparing graphically, such as on and off states of a switch, or measured and modeled responses of any two-port component. We've parameterized the device, with RON=2 ohm-mm, and COFF=0.3 pF/mm, typical values for a MESFET or PHEMT switch device. The parameter "Q" sets the size of the device in millimeters. We chose the size of the FET "Q" to be 0.4 mm, so that RON for this particular FET will be 5 ohms and COFF will be 0.12 pF. 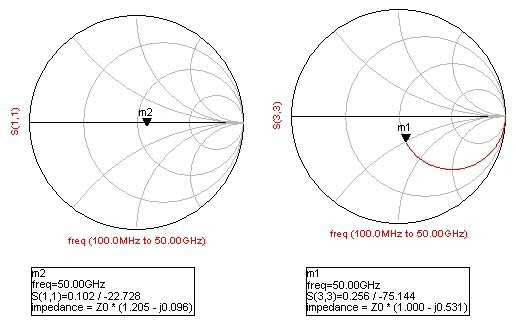 Here's the frequency response of the two states. 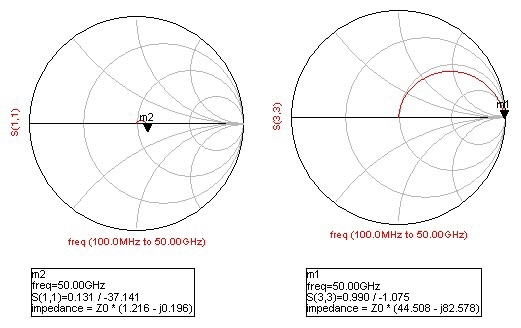 The ON state on the left is just to the right of fifty ohms at all frequencies, remember that it is modeled as a 5-ohm series resistor so on the Smith chart this represents 55 ohms (marker M2). The OFF state illustrates the behavioral problem associated with the FET's off-state capacitance. At DC it provides an ideal open circuit (the right side of the Smith chart) but at increasing frequency it starts to look more and more like a short circuit to 50 ohms (marker M1). How can you ever make a high frequency switch with all that capacitance? Now we'll add a shunt inductor to the FET. In this case it's not a lumped inductor, but a transmission line of high impedance (90 ohms). We played with the length of the line so that it resonated the circuit at 50 GHz. If you go to our resonant circuit calculator you'll see that a lumped element inductance of 0.084 nano-Henries would do the job as well. The OFF state is now nearly a perfect open at 50 GHz (and a perfect short circuit at DC!) Notice how the ON state is largely unaffected, the low impedance of the FET dominates the response, not the inductor. Next we'll add some more details to the switch FET model, stay tuned!